This creativity mission has been going on for seven years now, and we are very thankful to all designers who have contributed and are still diligently contributing each month. This post features free desktop wallpapers created by artists across the globe for August 2015. Both versions with a calendar and without a calendar can be downloaded for free. It’s time to freshen up your wallpaper! The post Desktop Wallpaper Calendars: August 2015 appeared first on Smashing Magazine. I eventually fell in with a guy named Bill O’Neil, who hired me to do contract programming. He formed a company with the regrettably generic name of Computer Research & Technologies, and we proceeded to work on various gigs together, building line of business CRUD apps in Visual Basic or FoxPro running on Windows 3.1 (and sometimes DOS, though we had a sense by then that this new-fangled GUI thing was here to stay). Entering a number instead of a string? Crash. Entering a date in the past? Crash. Entering too many characters? Crash. Does it work with unusual characters in names like, say, O'Neil? Nope. That was my first experience with the buddy system, and thanks to Bill, I came out of that relationship with a deep respect for software craftsmanship. I have no idea what Bill is up to these days, but I tip my hat to him, wherever he is. I didn’t always enjoy it, but learning to develop discipline around testing (and breaking) my own stuff unquestionably made me a better programmer. It’s tempting to lay all this responsibility at the feet of the mythical QA engineer. If you are ever lucky enough to work with one, you should have a very, very healthy fear of professional testers. They are terrifying. Just scan this “Did I remember to test” list and you’ll be having the worst kind of flashbacks in no time. And that’s the abbreviated version of his list. I believe a key turning point in every professional programmer’s working life is when you realize you are your own worst enemy, and the only way to mitigate that threat is to embrace it. Act like your own worst enemy. Break your UI. Break your code. Do terrible things to your software. This means programmers need a good working knowledge of at least the common mistakes, the frequent cases that average programmers tend to miss, to work against. You are tester zero. This is your responsibility. That’s just the first 10. There are thirty more. Plus a lot in the comments if you’re in the mood for extra credit. Or, how does Falsehoods Programmers Believe About Time grab you? Are there more? Of course there are! There’s even a whole additional list of stuff he forgot when he put that giant list together. I think you can see where this is going. 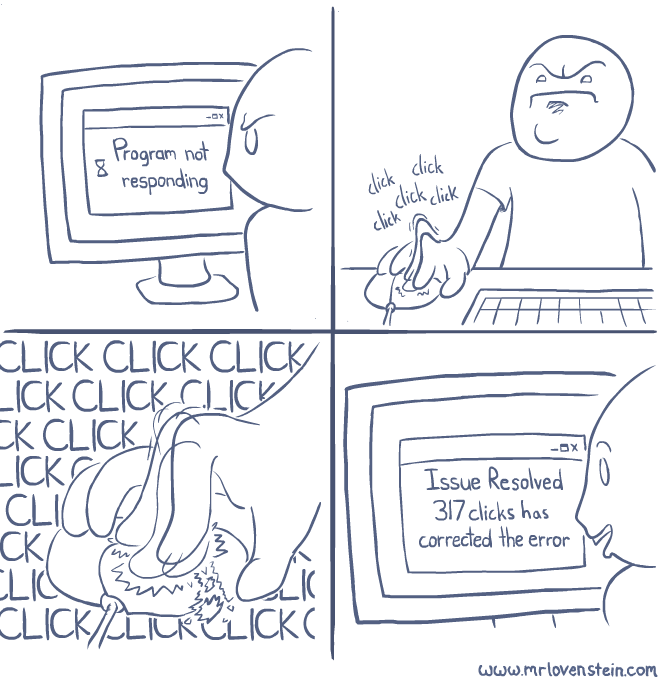 This is programming. We do this stuff for fun, remember? At this point I wouldn’t blame you if you decided to quit programming altogether. But I think it’s better if we learn to do for each other what Bill did for me, twenty years ago — teach less experienced developers that a good programmer knows they have to do terrible things to their code. Do it because if you don’t, I guarantee you other people will, and when they do, they will either walk away or create a support ticket. I’m not sure which is worse. Often within a project, the presentation of our content changes based on certain needs. We see this when we use media queries to change our styles based on the user device. CSS quantity queries follow the same concept of changing the styles based on a condition: the condition within a quantity query being the number of sibling elements. An example would be navigation where items are 25% wide when four items are available; yet when there are five items available, the width of the navigation items changes to 20%. This is a common problem with dynamic site frameworks like WordPress or Ghost. A client might not realize the complications that could arise, for example, by adding one more menu item when the CSS is not set up to fit it in. The post Constructing CSS Quantity Queries On The Fly appeared first on Smashing Magazine. When it comes to CSS techniques, nobody is more stubborn and smart enough to find solutions to any problems than Lea Verou. Recently, Lea has written, designed and published “CSS Secrets”, a truly fantastic book on the little CSS tricks and techniques for solving everyday problems. If you thought that you know CSS fairly well, think again: you will be surprised. In this article, we publish a few nuggets from the book, which were also presented in Lea’s recent talk at SmashingConf New York — on designing simple pie charts, with CSS. Please notice that some demos might not work as expected due to limited support in browsers. —Ed. The post Designing Flexible, Maintainable Pie Charts With CSS and SVG appeared first on Smashing Magazine. I’ve often heard there are four stages along the road to competence: unconscious incompetence, conscious incompetence, conscious competence, and unconscious competence. Most of us begin our careers “unconsciously incompetent,” or unaware of how much we don’t know. I’ll never forget the first time I moved from unconscious to conscious incompetence. I was working as an office manager at a small software company, and having been impressed by my writing skills, the director of sales and marketing asked me to throw together a press release, welcoming the new CEO. The post How Copywriting Can Benefit From User Research appeared first on Smashing Magazine. In UX design, few things are more intricate than time and personal time management — only a good arsenal of mobile design patterns and information architecture principles can save you. This is the story of redesigning the UX for a popular calenda tool on Android: Business Calendar. We’ll cover designing systems, interaction design problems, scaling across screens and platforms, research, and big business decisions and their outcomes. Business Calendar started out as a side project, a one-man show, and is now run by a team of eight in Berlin. The app was very successful right from the time Android entered the mainstream market, and it now has an active user base of 2 million. But instead of modernizing the design and usability regularly, the developers focused on implementing user requests and customization options. The post Making Time: Redesigning A Calendar Experience For Android appeared first on Smashing Magazine.